The third in the series of posts about McKinsey and Company 12 Disruptive Technologies, and one that being a nerd I absolutely love – The Internet of Things or Big Data. This one is huge for planners and local councils. Along with increasing mobile internet useage we are seeing a rapid increase in the number of connected devices per person. 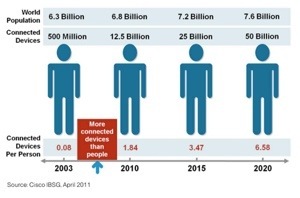 This great infographic from Cisco shows that they are predicting that by 2020 we will have 6.58 connected devices per person! Holy crap thats a lot of devices generating data that feeds into the internet of things. No wonder McKinsey think is going to be big – $36 Trillion in productivity savings to be exact! So what does ‘The Internet of Things’ mean to the property industry? Lets start with what The Internet of Things means – basically its an increased number of connected devices feeding data into the cloud. The connected devices might be sensors, smart phones, tablets, wireless devices or simple things like RFIDs (radio frequency identity tags). The most talked about Internet of Things device in the property industry at the moment would be smart meters that enable a smart grid. Something that measure something and sends that data to the cloud for use in other ways apart from measurement – ie use that data to modulate the power supply to the grid. But what about the future, what should we prepare for? Well, we have already started to see a small glimpse from Johnson Controls and also from Sociometric Solutions in the US, I posted more on this here. Both these firms have used RFIDs and smart sensors to study long term office efficiency and productivity by tracking how people are using the spaces provided. At the moment the sensors are only installed for a 4-8 week period to get an understanding of simple things like how often a meeting room is used and how many of the seats in the meeting room are used. This data can then be used to inform the next fitout or workplace design, gradually increasing the efficiency of our offices. Jump ahead 10 years, technology changes a lot in ten years, and we will see a far wider are more long term application of the Internet of Things on our property industry. I heard a statistic the other day that over 50% of the desks in offices in Sydney are empty on any given day – people on leave, interstate, on site, on the road etc etc. Imagine if the success we will see from the productivity and efficiency sensors installed by JCI and Sociometric is used on a city wide basis! And the data collected used to inform planning! Why do we need to build more offices in the ones we have are only half occupied. Imagine waking up in the morning and your smart phone has automatically looked at your calendar and noticed that you have 2 hours in between meetings in that are both in the south end of town. It then looks up the available desks from the new office leasing initiative from Investa that gives you desk space rather than floor space and your smart phone gives you a pick of 4 desks in different buildings. The smart sensors in those offices tells you the daylight, temperature and air quality of the last 4 weeks and your phone has learnt your preference from previous bookings, it also tells you who the people in the desks next to you work for to see whether they are collaborators or competitors. You then select the building you want from the short list and the phone automatically books you in. The smart phone updates you after your first meeting to tell you that a competitor has taken a desk next to you and asks if you want to change your selection, giving you an updated option list. You decide that you stick with your option knowing that you should always keep your competitor close. Knowing where people are, what they are doing, what their preferences are is very Big Brother and scary, but imagine the environment and cost savings from being able to design and operate our built environment with this knowledge. The Internet of Things will generate huge change in the way we design and operate not only our buildings, but also our cities and countries. How could you use the Internet of Things in your buildings now?